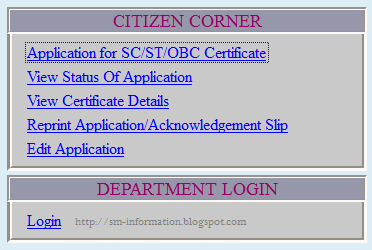 Step 2: On that webpage click on "Application for SC/ST/OBC Certificate" under "CITIZEN CORNER" Section. 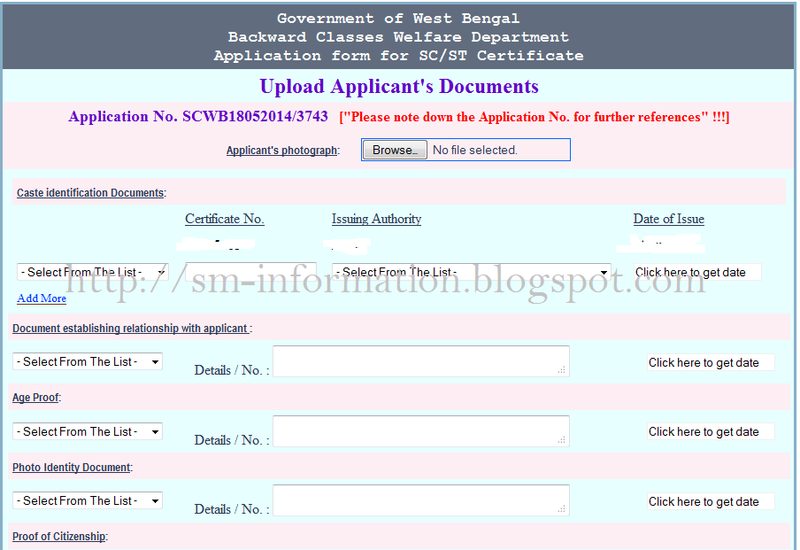 Step 3: After that you will get a online registration form called "Government of West BengalBackward Classes Welfare DepartmentApplication form for SC/ST/OBC Certificate" which contains many important and essential fields which you have to fill up carefully. Whether the applicant or his family migrated from other State/Country? Above heading contains also sub fields. Step 5: After filled up all Mandatory Fields (Marked as Red *) you will have a two options "View Before Submit" and "Save And Continue". It is use to check wheather you filled anything wrong information in the registration form or not and you will have a advantage to check it before going to next level. If you use this you will get a pop up box and check the filled form carefully and then click on "Continue" button. If you click on this then all the information you have putted in the form will saved automatically and will go to the next level of registration. Choose anyone between "View Before Submit" and "Save And Continue". Step 6: After that you will get another form which will ask you for and before going to fill up the below point note down your "Application No". Step 7: After fill up the all above correctly click on "Submit" button and your form will submit automatically and you will get your "Application No" and note it down immediately. Note : Do not forget you save your "Application No" of your caste registration form (Online). Note:All content is copyrighted to http://sm-information.blogspot.com and may not be reproduced on other websites. If you have any question regarding this websites or any other post related you can Email us. 4 Comments For " Application For SC/ST/OBC Certificate In West Bengal "
who can be the referee for caste certificate form fill up? will they have to have caste certificates? To get sc or obc certificate your parent's must have to have those certificates.